I think the point about flat marginal costs is a good one. Economists tend to throw neat well behaved production functions into models just because they are easy to use, but don’t often stop to think about how much this might be influencing their conclusions. However, I’m not sure that flat marginal cost necessarily implies multiple equilibria. The other factor here is labour supply, so you should be able to get a single equilibrium even in a pure service economy, where you have increasing disutility of labour time. In more real world terms, having a flat section of the Phillips curve, requires not only level labour productivity, but also a range within which real wage aspirations are flat. It is of course quite possible that this is also the case. Slightly off-topic, but that Lucas Rapping 1969 paper is just wrong IIRC. Buried in a footnote is an assumption that the nominal interest rate is constant, despite perfectly flexible P and W and fluctuations in expected inflation, which makes no sense from a GE perspective. Lucas 72 actually has a similar problem, because there’s no interest rate in the model, since currency is the only asset. Now to think about Lipsey’s paper. For simplicity, let’s ignore capital. Labour is the only input, and MPL is a constant, so each firm has a flat MC curve. And let’s also assume that elasticity of demand is a constant, so each firm sets price as a constant markup over MC, that is independent of output. We only get multiple equilibria if the economy-wide labour supply curve is perfectly elastic with respect to the real wage over some range. With an upward-sloping labour supply curve there is a unique macro equilibrium Y* and L*. If we start at Y*, then increase M and Aggregate Demand, and suppose that firms initially hold P constant and increase Y and L (moving along their flat MC curves), they would find they need to increase W, given P, to be able to hire more labour. And that increase in W causes their MC curves to shift up, so they would increase P in response. MC can be independent of Y for each individual firm (flat MC curves), but an increasing function of Y for firms in aggregate (the flat MC curves shift up if all firms increase Y). I share Lipsey’s vision of the economy. I like the risk vs. uncertainty a lot. I think that this very much suggests that targeting interest rates is a terrible idea. And further, that short term real interest rates might need to be negative sometime. Coordinating saving and investment in a world of creative destruction could easily require substantial variance in short term real interest rates. I agree that there is no guarantee that independently adjusting price to clear each market will result in a historical process of bringing the economy into a general equilibrium. I have always thought that the fact that each price is of a good that is a substitute, complement, input or output of other goods creates more disequilibrium. But I also understand that actual earnings impact demand, and actual earnings are less than equilibrium earnings in disequilibrium. Does the conclusion follow that policy makers can effectively determine the average level of aggregate demand and so aggregate employment? The economy is running slow, so we should increase government spending? Or is this just a claim that the central bank should vary interest rates a lot? Or maybe that looking for some fixed coefficient to predict how interest rates will impact aggregate demand is a fools errand? 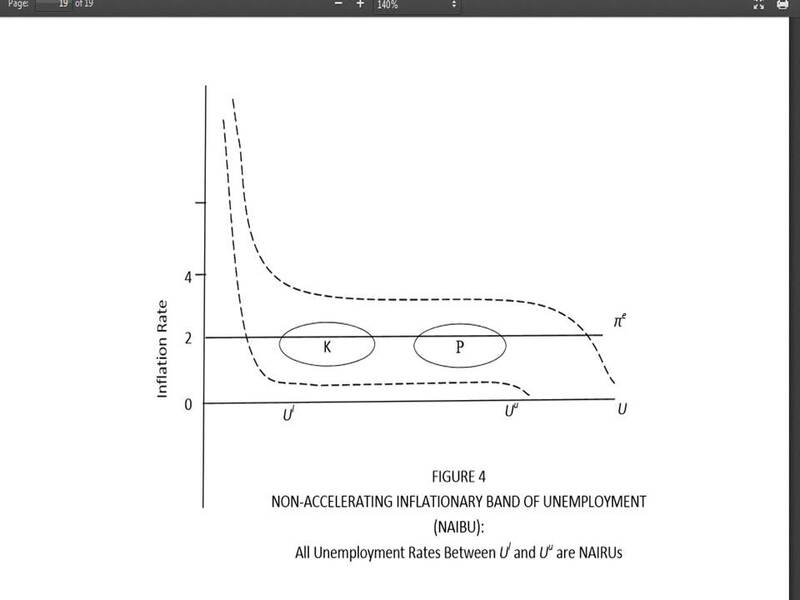 Lipsey’s approach the the macroeconomy suggests that targeting the unemployment rate or real output is a bad idea. They aren’t well defined. I still favor a 3 percent growth path for nominal GDP even if I fully anticipate that real GDP will not remain on a 3% growth path. Let the price level adjust. I don’t think the no natural tendency to get to equilibrium tells us that much at all. It seems to me that targeting the GE level of real output would be a good idea. I suppose we might believe that more or less aggregate demand would make no difference as prices and wages just cobweb about and output is less than optimal because of shortages and surpluses. Really, I think that Glasner’s point explains why centrally planned economies like North Korea are so much more productive than market economies. Depending on decentralized price setting just doesn’t work to coordinate the economy. Only if all the prices are set once and for all, will perfect coordination occur–at best more or less like the geniuses at the North Korean planning agency who consider all production possibilities and pick the optimum one and have have all of the plant managers follow the instructions–take the resources delivered to you, produce this output and deliver it there. It is only common sense. I guess I should read more of Lipsey, since I like his vision of the economy so much.. But is he really saying that the old Keynesian view of flat marginal cost curves is correct? How does that apply to creative destruction? Surely the old Keynesian view is very much static Unemployment rises and falls as the same old factories let workers go or hire them back according to the demand for unchanging products. Are we really going to say that the expanding firms producing the new products or some old product in a new way can be characterized by a horizontal marginal cost curve? As the wreckage of failed plans is put together in new ways, wouldn’t competition for these pieces, including workers, impact their prices? While I am not sure about the relatively new data we now see about quits, layoffs and hires, it certainly suggests that seeing employment as existing firms letting people go and hiring them back is not that much of the story we are trying to understand. Isn’t there an assumption in these cost+markup models (where its easy to derive multiple equilibria) that W will not rise as L increases until a point of full employment is reached and cost-push inflation starts to kick in ? If this is an Old Keynesian model we’re talking about, on my reading of it at any rate, the labour supply curve does nothing apart from telling us how much involuntary unemployment there is. Nick Edmonds, Glad you liked it. I have not thought carefully about whether flat firm marginal costs over some range is sufficient to ensure multiple equilibria. I think the general message from the GE literature is that the necessary conditions for guaranteeing a unique equilibrium are quite strong, so there is certainly no theoretical basis for the assumption that a general-equilibrium solution, if it exists, will be unique. Nick Rowe, Thanks for pointing out that flaw in the Lucas Rapping paper, which I haven’t looked at for about 40 years. I take your point about the labor supply, but it doesn’t seem implausible to me that there is a range over which the labor supply curve is perfectly elastic. In their textbook, Alchian and Allen have discussion in which they explain how demand can cause inflation even if all firms are setting price by applying a fixed markup over their costs. So I do agree with you that my statement about a flat Phillips curve being a straightforward implication of flat marginal cost curves was too strong. On the other hand, I think it is not implausible to assume that over a range of unemployment rates, the Phillips curve could be pretty flat. Bill, I can’t speak for Lipsey, but I suspect that he would not recommend going back to the good old days of Keynesian aggregate demand management. That certainly would not be my recommendation. But just because we don’t want to go back to old Keynesianism doesn’t mean that we can’t look critically at some of the arguments that were used to debunk old Keynesianism. I think the natural rate of unemployment is an idea that makes sense only in a very simplistic model that doesn’t capture a lot of important and fairly obvious features of the real world. I think that NGDP level targeting is a fine idea, but I suspect that if it is ever adopted, we will not be entirely happy with its results, either. First assume the labour supply curve is a reverse-L-shaped function of the real wage W/P. So it’s flat at some level (call it “v”) until we hit full employment at L*, and is vertical thereafter. If v (1-1/e), there is a unique equilibrium at L=0 (100% unemployment). If, by sheer fluke, v = (1-1/e) we get a range of equilibria between L=0 and L=L*. If instead we assume the labour supply curve is a reverse-L-shaped function of the nominal wage W, we get a standard Old Keynesian reverse-L-shaped AS curve. If v is less than (1-1/e), where e is the (assumed constant) elasticity of an individual firm’s demand curve, there is a unique equilibrium at L=L* (full employment). If v is greater than (1-1/e), there is a unique equilibrium at L=0 (100% unemployment).